HINO was formed in 1942 by a break-away group from the Tokyo Jidosha Kogyo Co., they produced diesel trucks and buses until 1953. In March 1953, they obtained a licence to build the tiny four door French Renault 4CV saloon. 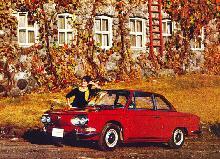 This was assembled until 1961, when HINO began to build their own car, the Contessa 900 sedan which had a 35hp rear-mounted 893cc Renault inspired engine. The hardtop coupe version was introduced in 1962. It was designed by the Italian stylist Michelotti and an engine of 45hp was fitted. 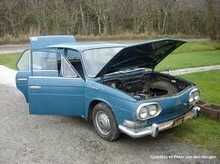 In 1964, Michelotti completely re-designed the whole series, using a new 1,251cc rear-mounted engine of 55hp in the sedan and a 65hp unit in the four seater hardtop coupe. The cars had independent suspension and an all synchromesh gearbox. The four seater coupe could achieve a top speed of 90mph. HINO cars were supplied as CKD (Complete Knocked Down) units for assembly in Eastern Asia and South Africa and were the first Japanese cars to enter Europe in this way by supplying cars to Spain and Greece. HINO was taken over by the rapidly expanding Toyota Company in 1966 and HINO 'Briska', a light commercial truck, was the basis of Toyota's very successful 'Hi-Lux' that was introduced into the Toyota range in 1968.